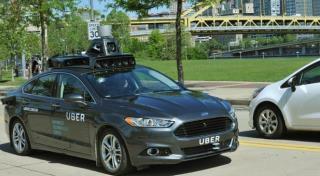 (Newser) – If you're in Pittsburgh over the next few weeks and see a Ford Fusion cruise by with a driver who doesn't seem to be doing much behind the wheel, you may be witnessing one of Uber's new self-driving cars. Even though many analysts have said the advent of truly autonomous vehicles is many years away, Uber CEO Travis Kalanick apparently couldn't wait that long, reports Bloomberg, tapping into robotics experts, engineers, and mechanics to beat Tesla, Google, and even old-school Ford to the punch. Toward that end, Uber will bring a fleet of custom cars—the AP notes it will consist of both the Fusions and soon-to-come Volvo SUVs—to Pittsburgh later this month so customers can commission temporarily free rides. It's all part of Kalanick's plan to eventually phase out Uber's human drivers and swap in the robots, which he says will make per-mile costs super-low and save lives. Pittsburgh is notoriously difficult and dangerous to drive in. I hope they use out-of-towers behind the wheel to get a good test. So much for those Uber jobs and any Taxi driver jobs. They will all soon be replaced by technology. Sounds awesome but I don't want driverless cars but robotics to supplement truck drivers and long haul delivery drivers getting fatigue.